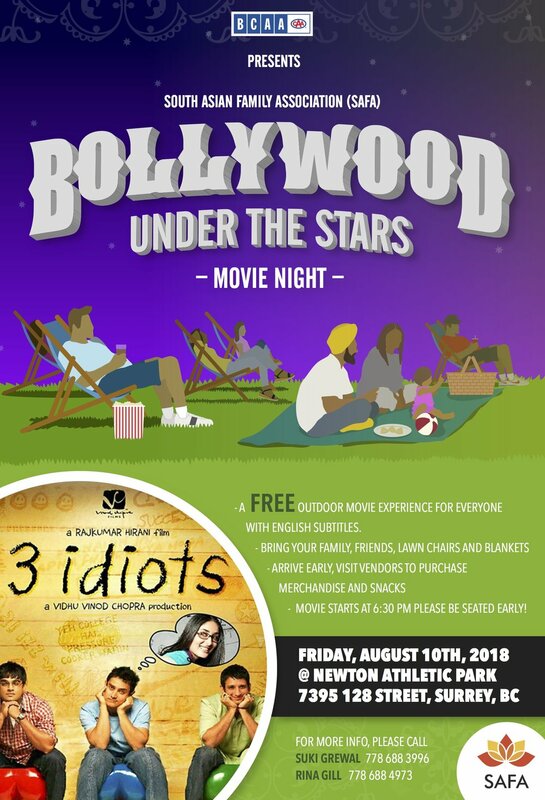 - Bollywood Under The Stars Aug 10th from 6-10 pm at Newton Athletic park-7395 -128 street surrey. 3 idiots is the movie this year. 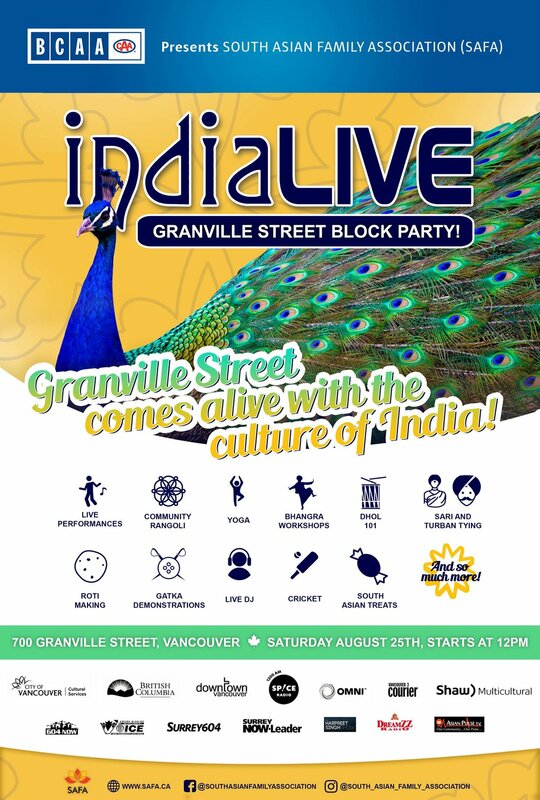 India Live will take place on Aug 25th from 12-7 pm on Granville street Vancouver BC. This year our headliner is Mickey Singh! The South Asian Family Association (SAFA) is a non-profit organization dedicated to highlighting the South Asian community and culture. Our goals are: to promote positive images of the South Asian community; enhance cross-cultural understanding; and empower families to maintain their heritage while embracing Canadian culture. Some of the ways we have accomplished these goals include organizing Indian festivals (including our annual summer India Live festival and Diwali functions); providing annual scholarships to high school students who have demonstrated excellence in academics and community service; holding International Women's Day forums and Mothers & Daughters dinners; running youth summer camps; and organizing health fairs for the South Asian community. Learn more about us here. Our annual feature cultural festival is India Live. India Live has been comprised of two events: Bollywood Under the Stars, a free outdoor movie experience featuring a popular Bollywood film with English subtitles; and India Live, a free street festival highlighting the vast Indian culture, including live song and dance performances, yoga demonstrations, turban tying, kara racing, roti-making competitions, Gatka demonstrations, scholarship presentations, and much more! In 2016 SAFA was pleased to add a third event to India Live, An Evening with Malkit Singh, a fundraiser dinner with headline performer Malkit Singh. Guests were given an unique opportunity to dine and mingle with the singer, experiencing and learning about Bhangra from the best in the business. In 2017 India Live was headlined by Mankirt Aulakh.